Alison is running the guesthouse having made it clear she is no longer assisting Paul Harrison, in any more murder investigations. Paul is her resident ghost detective. 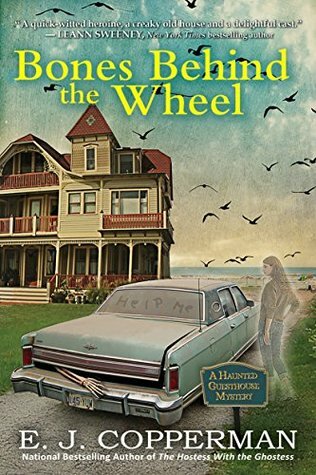 But when a simple excavation in her backyard to help shore up the beach uncovers an old Lincoln Continental with a dead passenger. Alison’s backyard may be off-limits but she is still hosting guests and trying to repair the bullet damage done to her beam in the kitchen when the crew finds a treasure. Now her kitchen is a crime scene. Things are quickly getting out of hand and it doesn’t help that now Maxie wants to redecorate the room. Even Josh is getting in on the investigating having learned how to text to speak to Paul. It doesn’t take long for Alison to put her detective hat back on. But this one may be too much for her, even with her resident ghosts. These ghosts make the series. They are always evolving and now Maxie is determined to start designing again. And a ghost puppy? Who could resist this colorful and funny group of characters. All living together under one roof. You can read it alone but I warn you you’ll go back and read the rest. I am very fond of the way the writer tells the story. It’s not traditional, more conversational. Very nice.